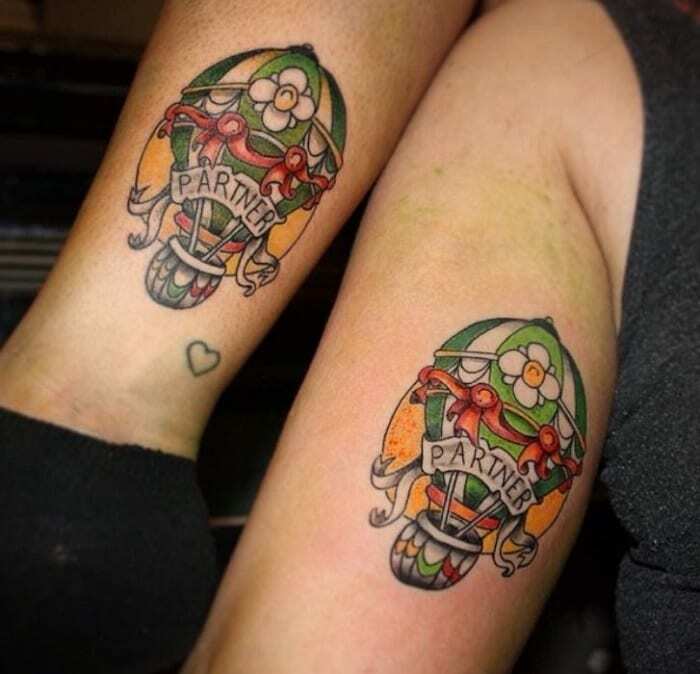 When most people hear the phrase “couples tattoo,” they probably have to suppress a groan. 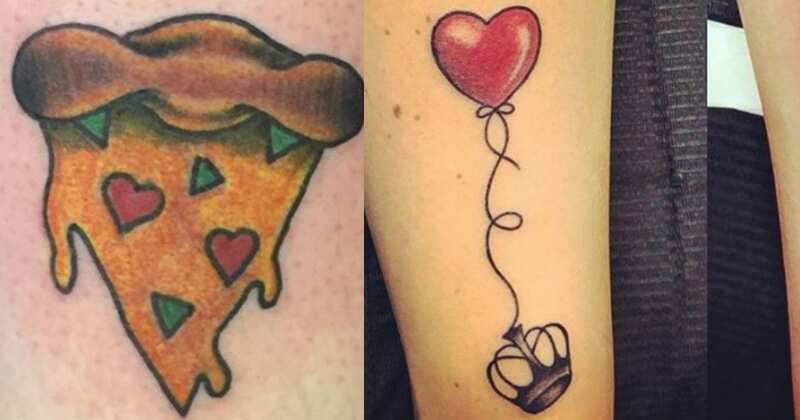 Let’s face it: we’ve all seen some absolutely terrible couple tattoos. Even worse are the tattoos that contain a significant other’s name. Because, well, if the two of you decide to go your separate ways, you have one of three choices. You can get the tattoo removed, which is expensive and painful, you can cover it with another tattoo, or you can walk around for the rest of your life with your ex’s name on your skin. 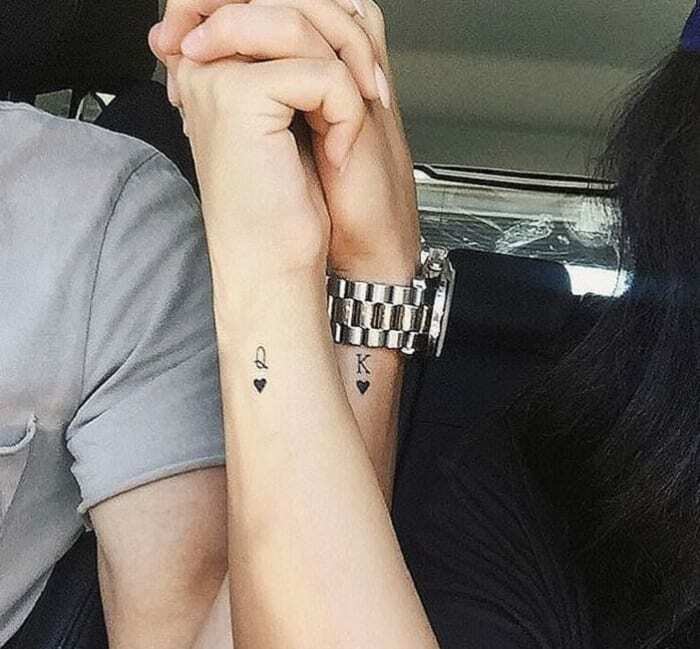 When looking for cool ways for you and your significant other to express your love in ink, take some inspiration from these gorgeous tattoos. 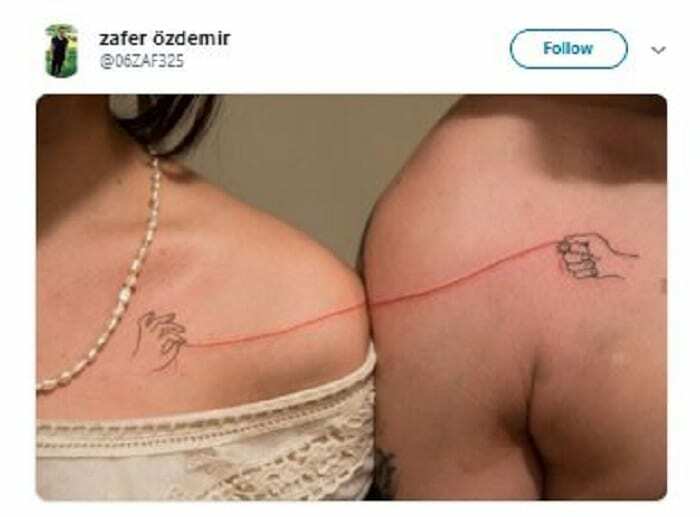 It seems like there are a few simple rules for couple tattoos: keep them tasteful and beautiful, make them something meaningful to both of you, and for goodness’ sake, don’t include the others’ names! 1. Tie a string around my heart. This tattoo is subtle and clever. Each partner has one hand pulling on a red string … a heartstring, anyone? Apart, they don’t make too much sense, but when put together, they are a simple design that makes their message pretty clear: they’re together for the long haul. 2. She may not be the Queen of Hearts, but she’s the queen of his heart. 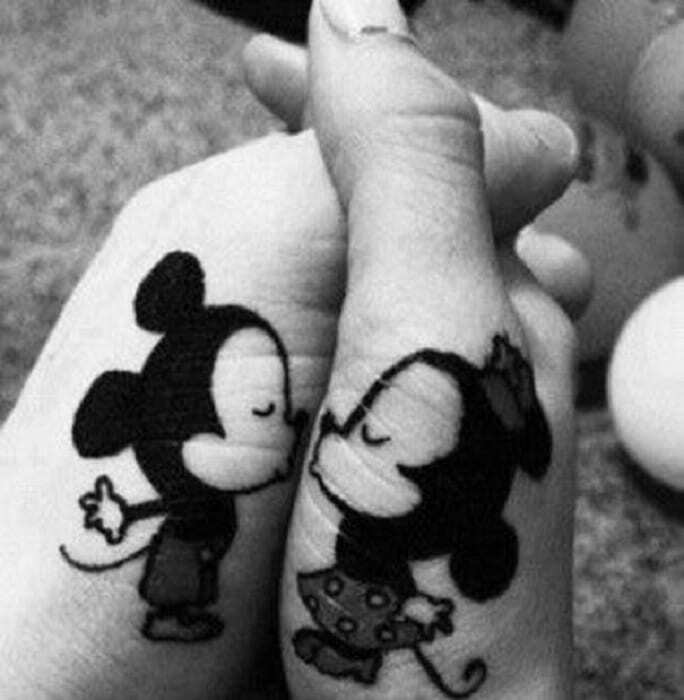 Here’s another awesomely simple couple tattoo design. If you look closely, the two crowns are just a little bit different. 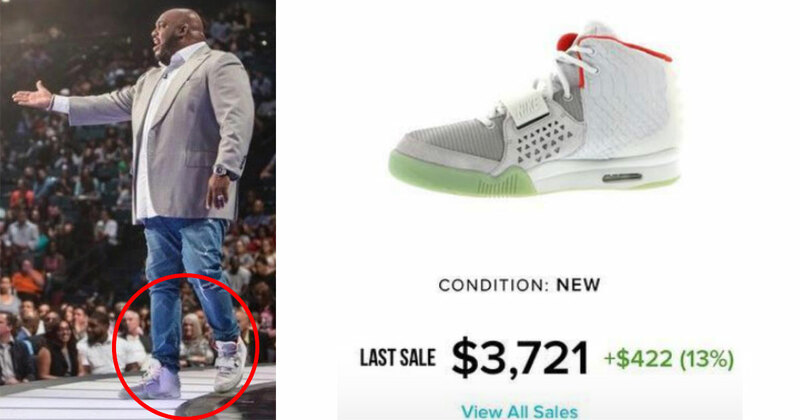 The explanation is obvious: one is for a king and the other is for a queen. To really get the message across, they’re each tied to a red heart balloon. 3. Making a couple tattoo into a parent tattoo. This couple was blessed with a baby girl, so they decided to get tattoos dedicated to her. Each one is individual but shows their own special moments with their daughter. 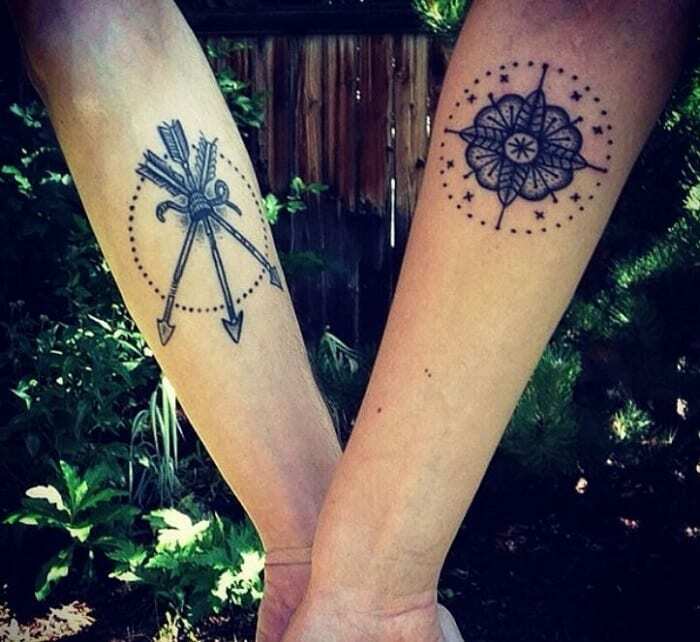 It’s a special kind of couple tattoo that they can both share and treasure in different ways. They have one lucky little girl! 4. Together, they complete the picture. 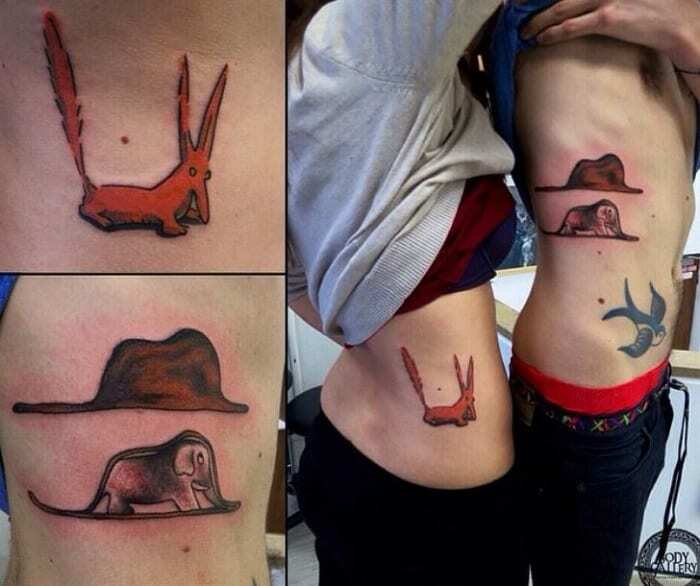 This is such an amazing couples’ tattoo! Apart, each person has a picture consisting of only part of a bird taking flight. When they join hands, however, the picture is completed. It’s a subtle way of saying that when they’re beside one another and holding hands, each of them is completed, too. 5. 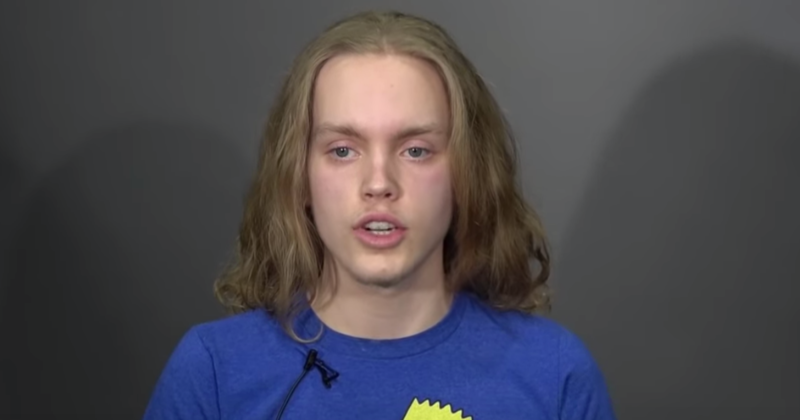 Why don’t you take me to your leader? 6. A subtle literature reference that’s all about love. If you don’t recognize these tattoos, you should hit the library. These illustrations are straight from the classic “The Little Prince” by Antoine de St.-Exupery. The story is about a boy who leaves his planet to travel around the galaxy and what he sacrifices to return home to his beloved rose. 7. These tattoos are for a pair that will last a lifetime. 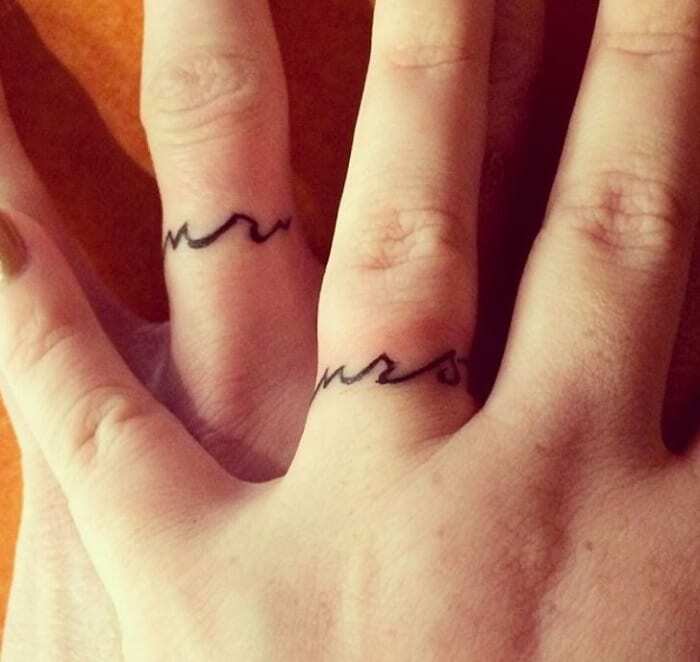 Sometimes, couple tattoos aren’t just for romantic couples. These ones were designed by the artist for a pair of sisters. 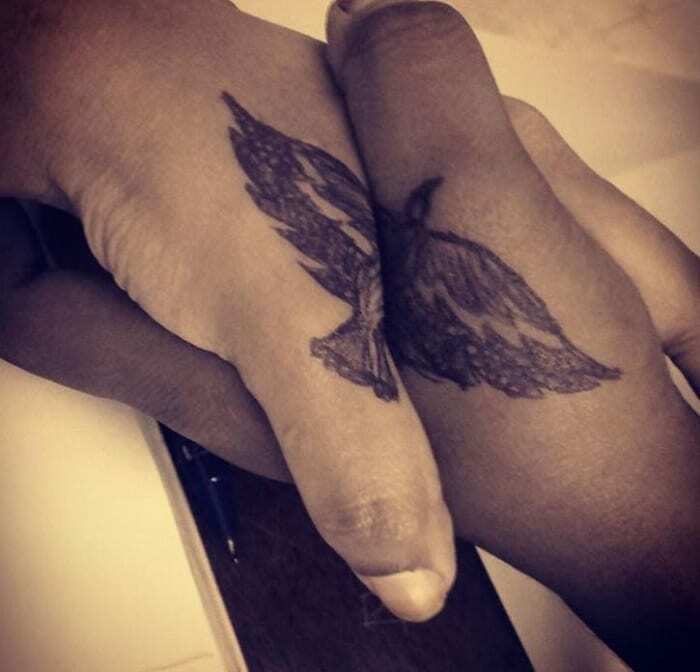 It makes total sense for them to get a pair of tattoos dedicated to one another. After all, sisterhood, for better or for worse, lasts a lifetime. 8. Here’s a reference from a totally different kind of book. 9. One of us is the fluffy cat, one is the skinny cat. 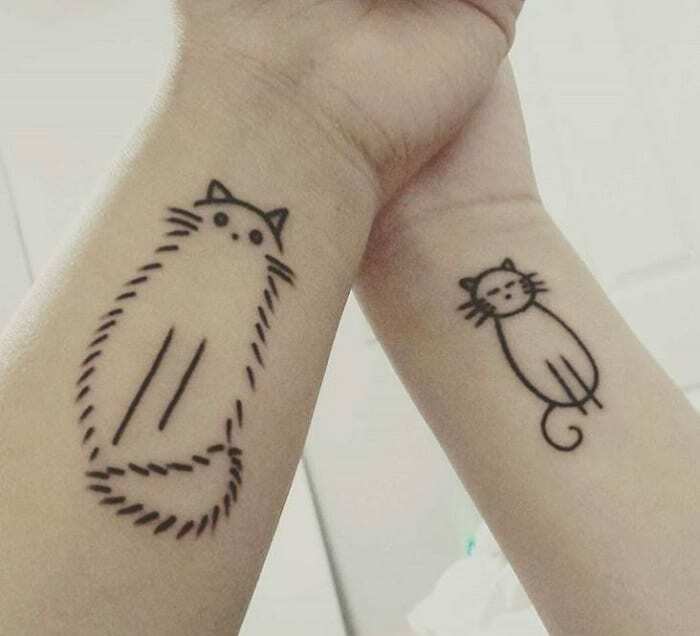 These adorably minimalist tattoos are of two cats with too much personality not to be from real life. Maybe they belong to the couple and represent their home together. One of the cats is big and fluffy, the other is sleek and trim. Just like couples, pets can be totally different from one another. 10. Hopefully, they’re not digging through any trash cans together. This couples’ tattoo is a little subtler. 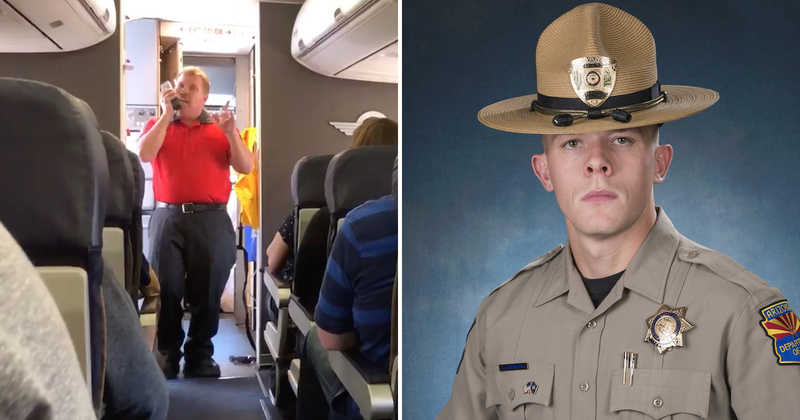 You might not even know that there were two parts to it unless you saw them together. They’re each totally striking in their own way, and when they are seen side by side, it’s obvious they’re a pair. 11. 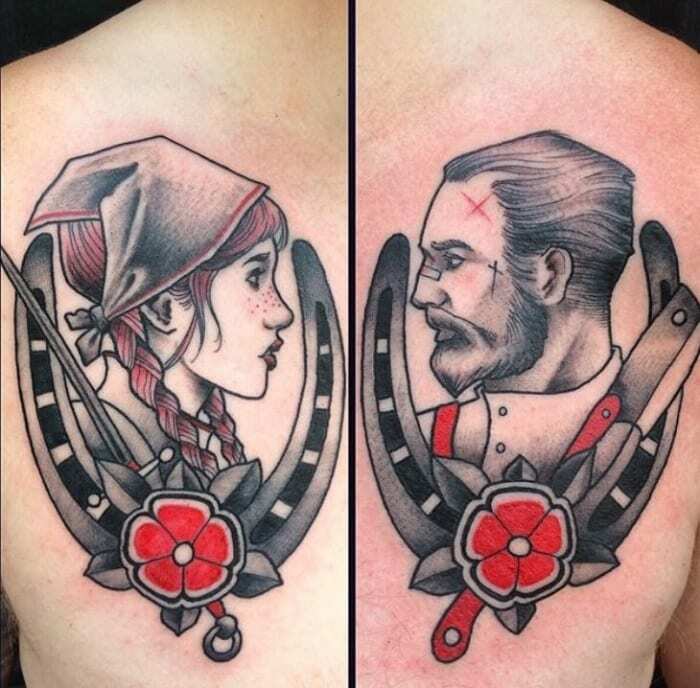 A couples’ tattoo with a pop culture reference. This couple had another interesting idea involving a movie that was important to both of them. 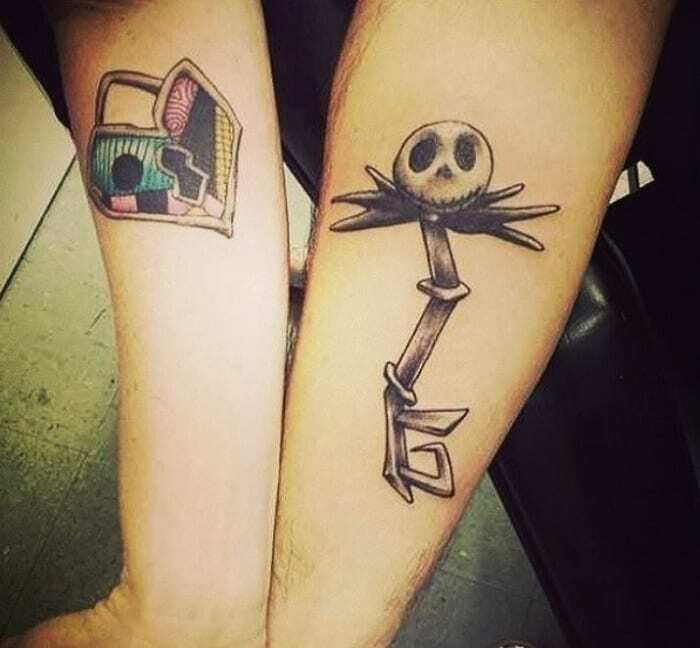 Their reference is to “The Nightmare Before Christmas.” It’s an interesting riff on the idea of keeping the key to someone’s heart, but for this couple, it was perfect. 12. Apart, these Tetris squares don’t make sense. These days, most people probably don’t play or know much about the classic game Tetris. But these tattoos are pretty obvious even if you’re not familiar with the concept. There’s only one block that can join those two blocks together, and there’s only one place you’re going to find it. 13. Let’s fly around the world together. These hot air balloon tattoos are adorable. They’re each labeled with one simple word: “partner.” It’s a way of saying that this couple is ready to travel through life together in one “balloon” because they’re partners, and that’s what partners do. 14. Shot by Cupid’s bow? 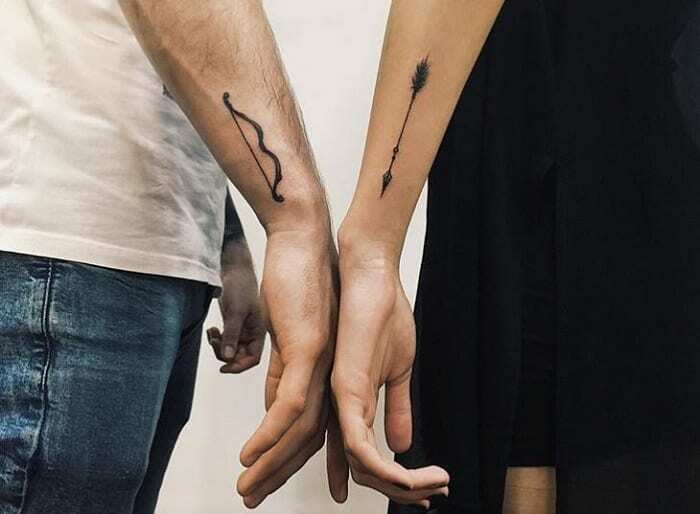 This couple’s tattoo looks like a cluster of arrows and a target, giving a whole new meaning to the phrase “shot in the heart by love.” They opted for black and white instead of color, and it’s a super striking look against their skin. What a beautiful, classy way to express their love! 15. This couple had another take. Here’s another version of the same idea, though this time instead of a target and a quiver of arrows, it’s a single arrow and a bow. 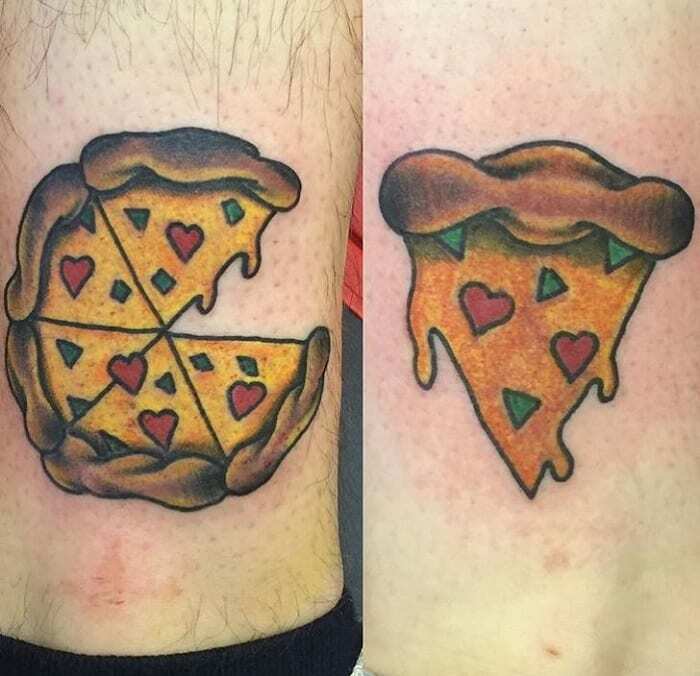 The two tattoos look great on their own, but when combined, they’re really unique. Clearly, this idea is popular for good reason! 16. This one is absolutely adorable! There’s nothing like evoking a famous couple to make a tribute to your own relationship. In this case, the two chose a couple that’s pretty darn iconic: Mickey and Minnie Mouse. They’ve been together for going on 90 years now, and they’re still as strong as ever. 17. Lasers and dinosaurs and spaceships, oh my! There is a lot going on in this couples’ tattoo. 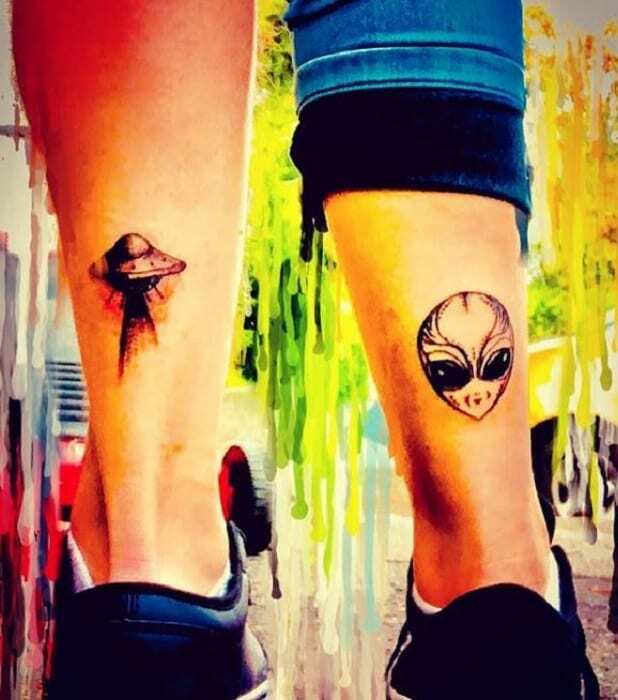 From dinosaurs being beamed into space to planets colliding, these tattoos certainly tell a story that we might not quite understand. But it’s still an eye-catching piece of art that tells, well, quite an interesting tale about this couple! 18. They’re part of the same wolf pack. This couple got these beautiful wolf tattoos to express their feelings about one another. In every wolf pack, there’s a leading pair that takes care of the others together. The alpha male and alpha female look out for one another and the rest of their pack. 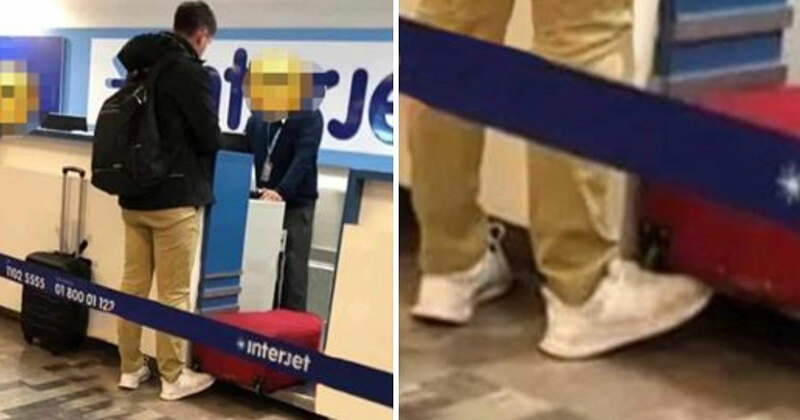 This couple seems to be saying they’re one another’s alphas. 19. Just a whisper of a tribute to one another. 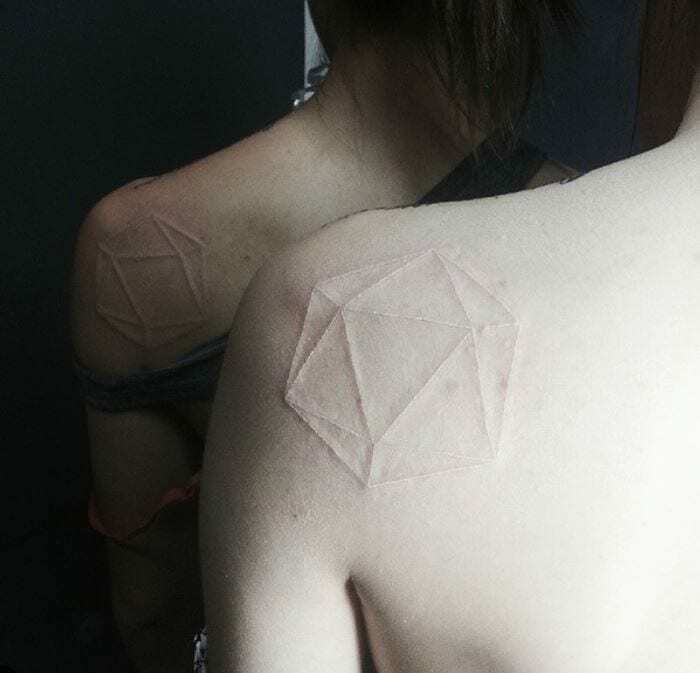 This couple chose white ink tattoos, which barely leave a trace on the skin. The subtle, matching geometric shapes are a quiet testament to their love for one another without making it loud and attention-grabbing. It’s yet another awesome way to honor an important relationship. 20. This one is vibrant and eye-catching. 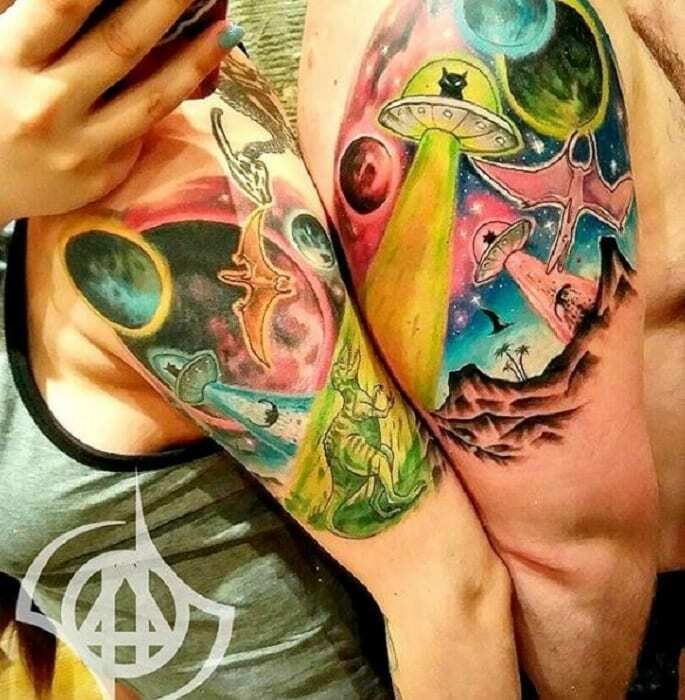 This couple went for something completely different: loud, colorful tattoos that draw the eye toward them immediately. From the big red flowers to the intricate portraits, these tattoos are not about being subtle. But that’s okay — some couples are very private, while others want to yell their love from the rooftops! 21. 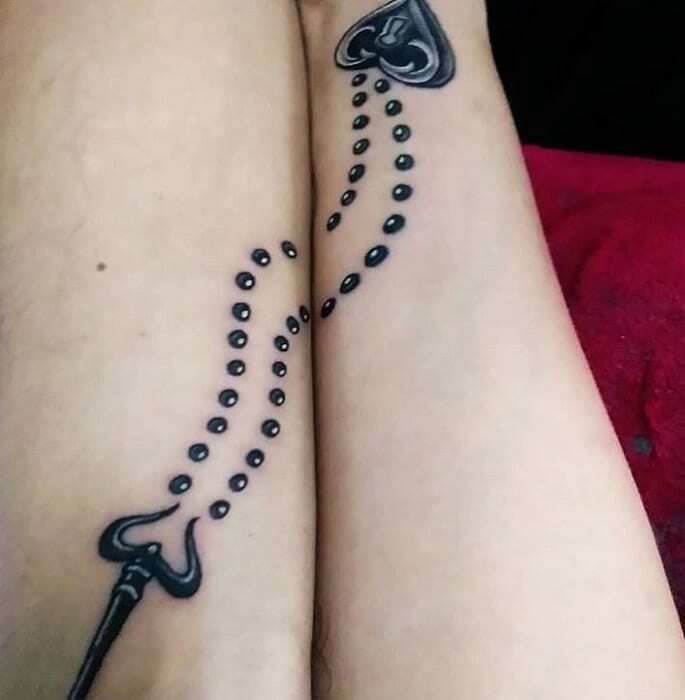 How about a tattoo of the most classic symbol of love? This couple went for one of the most classic symbols of love around – their own wedding rings. If you look closely, you can see the rings are actually made up of text: his tattoo says “Mr.” and hers says “Mrs.” The couple actually got them to celebrate their 10th wedding anniversary. It’s a perfect way to make a tribute to their marriage. 22. These happy seals are celebrating a big day. One awesome thing about couple tattoos is that you get to see a glimpse of the couples’ personality together and as individuals. 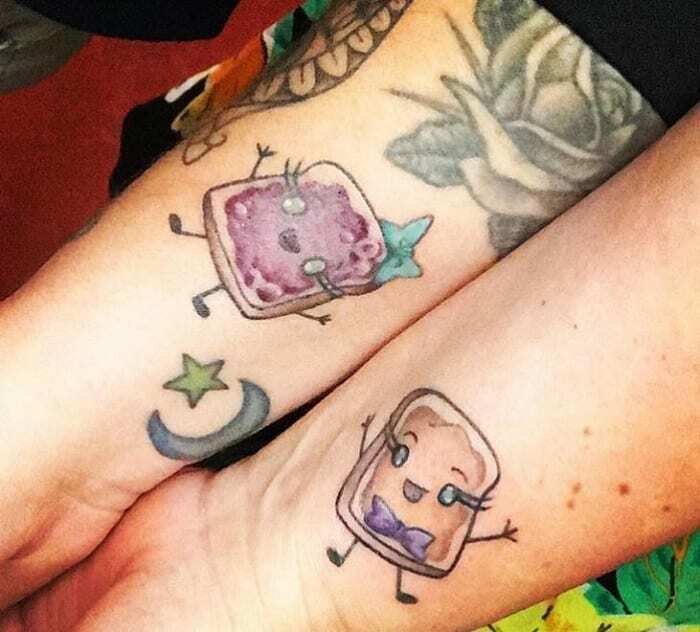 From elegant to sentimental to zany, couple tattoos express who they are as a team. 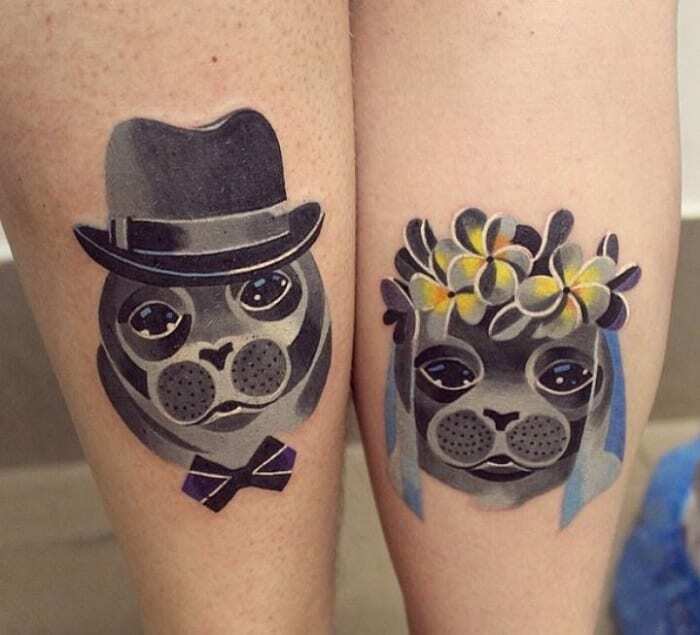 These colorful seals on their wedding day are a perfect example of a whimsical pair. 23. Another subtle pop culture reference to share their love. 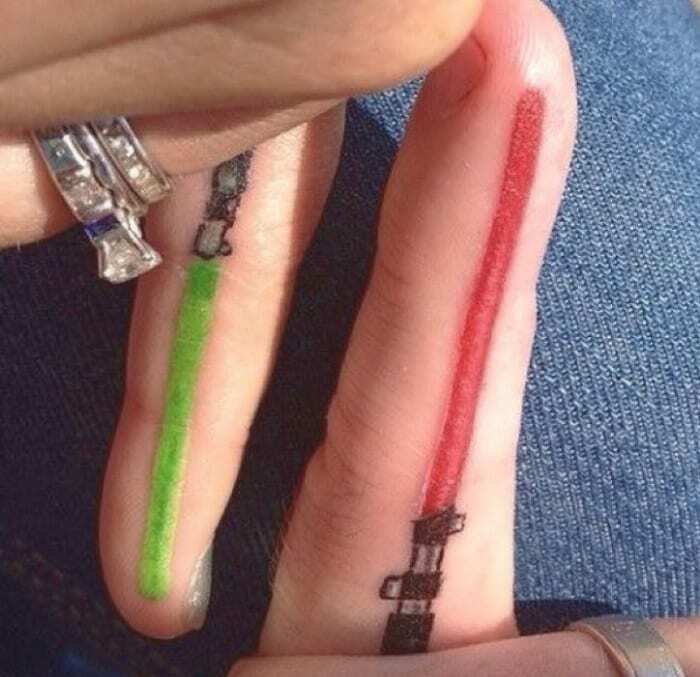 These two lovebirds are clearly fans of the “Star Wars” movies, so much so that they decided to get lightsabers as their matching tattoos. One of them has a green lightsaber, while the other has red, a nod to the bad guys in the series like Darth Vader and Kylo Ren. 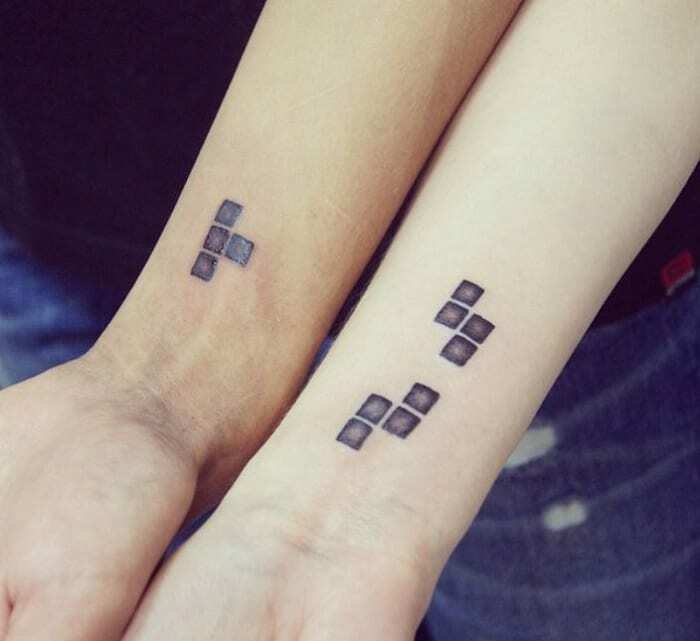 It’s a perfect couples’ tattoo for two people who love to geek out together. 24. This is perfect for a couple that’s all about healthy eating. 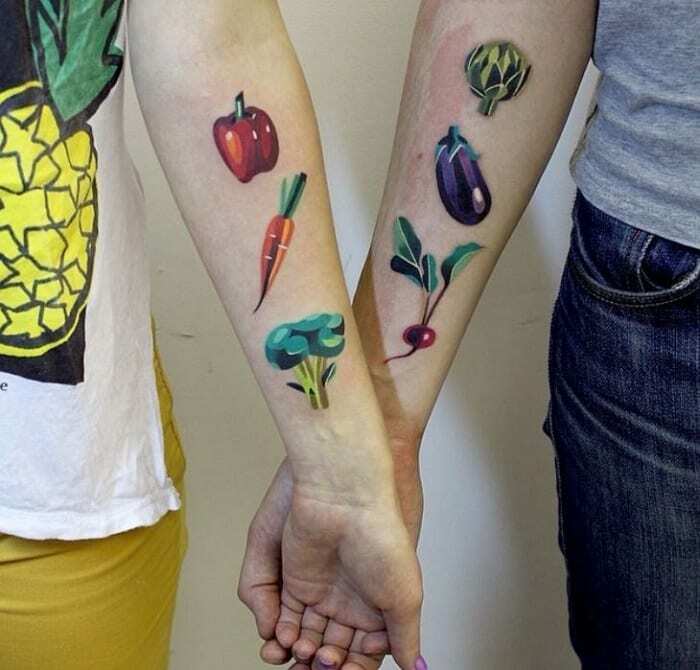 These colorful graphics vegetable tattoos are a perfect example of a couple’s uniqueness. 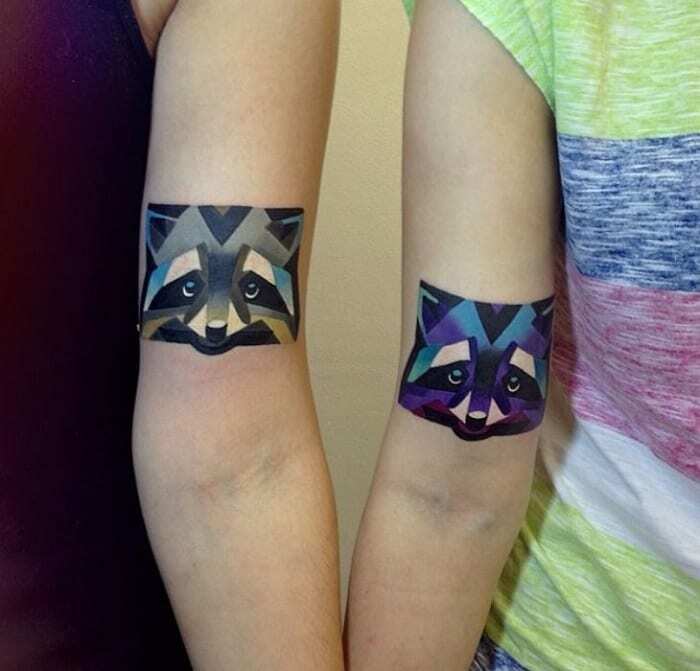 Who would have thought of something like this for a matching tattoo? Maybe this couple is passionate about being vegetarian or love health eating — or maybe they met in a community garden or over a salad bar. At any rate, vegetables have a lot of meaning to them! 25. 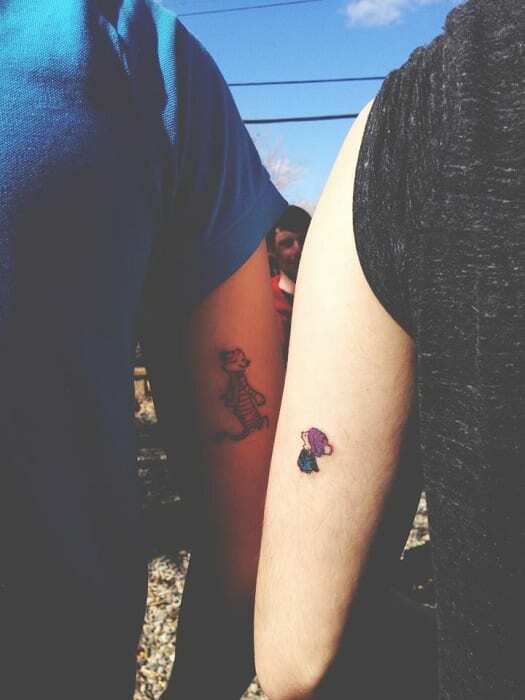 These tattoos have a smattering of humor. 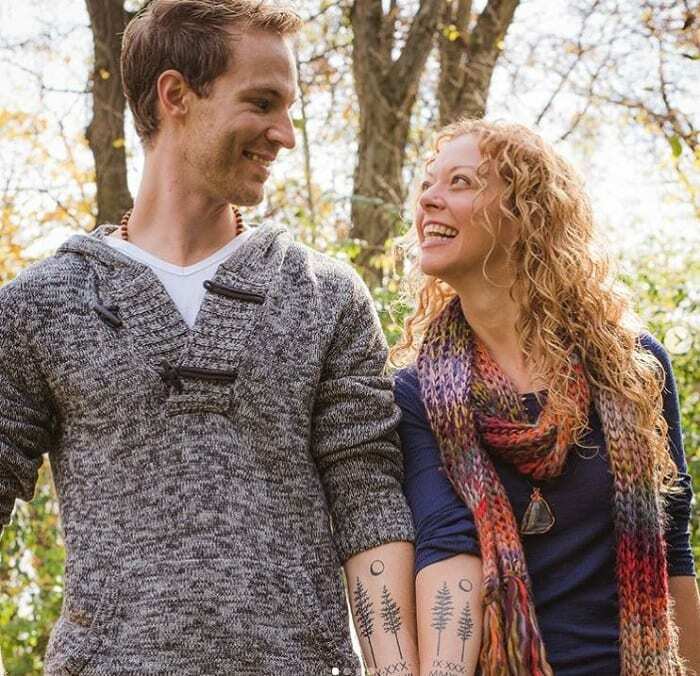 This couple clearly has a problem with running behind schedule, so they’ve helped themselves with some tattoo watches. 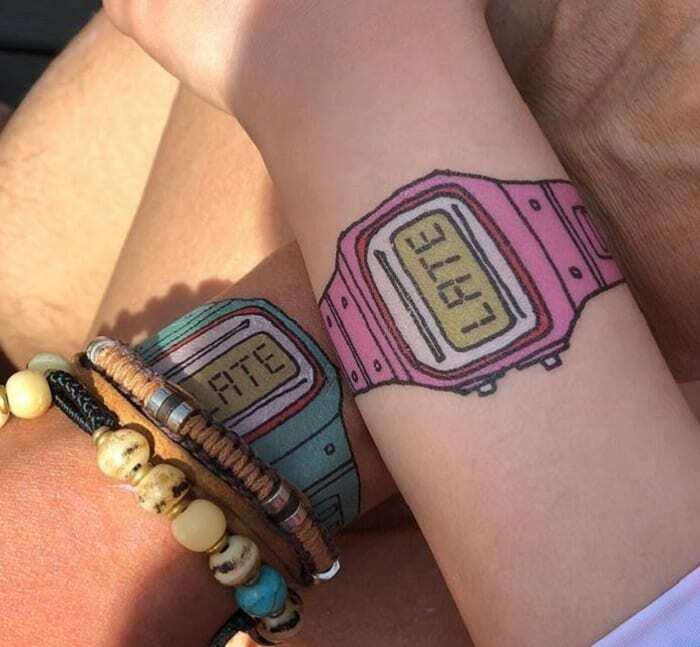 Except that the tattoos simply say “late,” so they’re pretty much a reminder that, no matter where they’re going together, they’d better get a move on! 26. Together, they complete the chain. This tattoo is a beautiful one that’s both subtle in its meaning and bold in its design. You need both people to complete the chain since one has the lock and the other the key. While its meaning might not be perfectly clear when you see the tattoos separately, it all becomes apparent when the couple is side by side. 27. Comparing the differences between them. 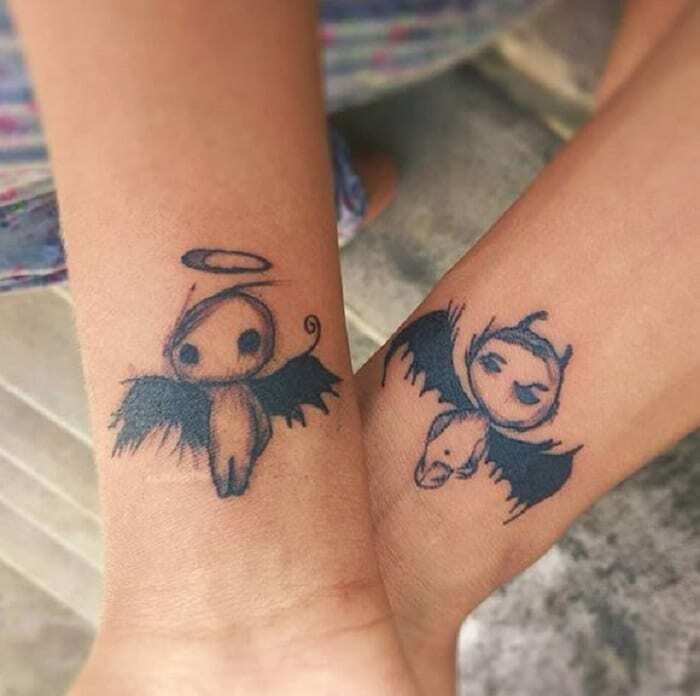 These tattoos are all about contrast: one of the figures is an angel and the other a devil. While we’re pretty sure that the couple isn’t THAT heavenly or hellish, it’s a clever way to remind everyone that for some people, opposites attract. Hopefully, they’ll be a good influence on one another! 28. There’s only one way to connect all these pieces. 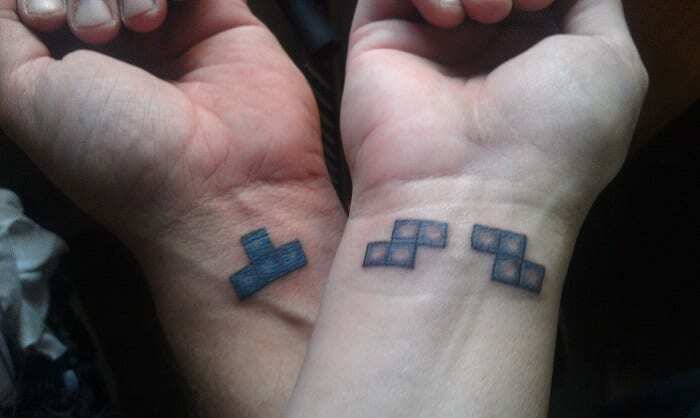 Here’s another couple that used a Tetris theme to describe how perfectly suited to one another they are. There’s only one way they can connect all the pieces of that puzzle. To do that, they need one another. It’s as simple and perfect as that. 29. Here’s a physical reminder of all those promises. If there’s one thing any couple knows, it’s that relationships are all about sticking to your word. When a couple gets married, they make vows, and it’s their job to keep those vows (and hopefully, they do a pretty good job of that!). 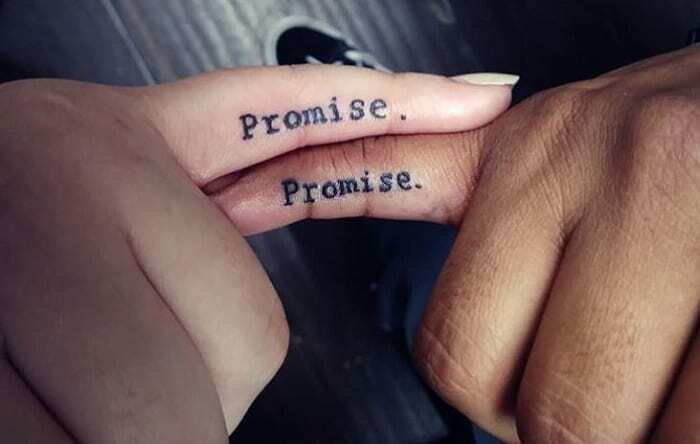 This couple decided to add a new element with a reminder on their pinkies of their promises. 30. You’re my sun, my moon, my everything. The sun and the moon go together in our minds. They may be different, but they’re two planets that keep the Earth turning and full of life. 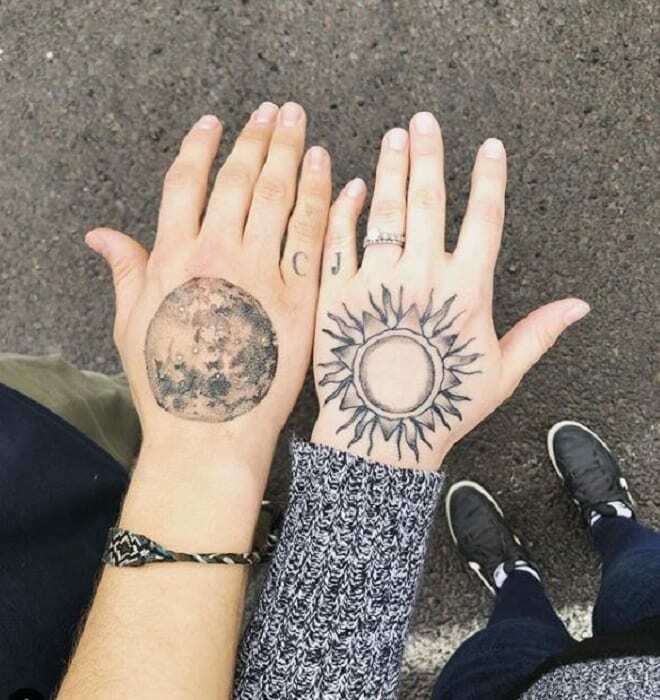 This couple took that idea and ran with it, making themselves into each other’s sun and moon who keep each other together. 31. This couple doesn’t intend to take their wedding rings off. 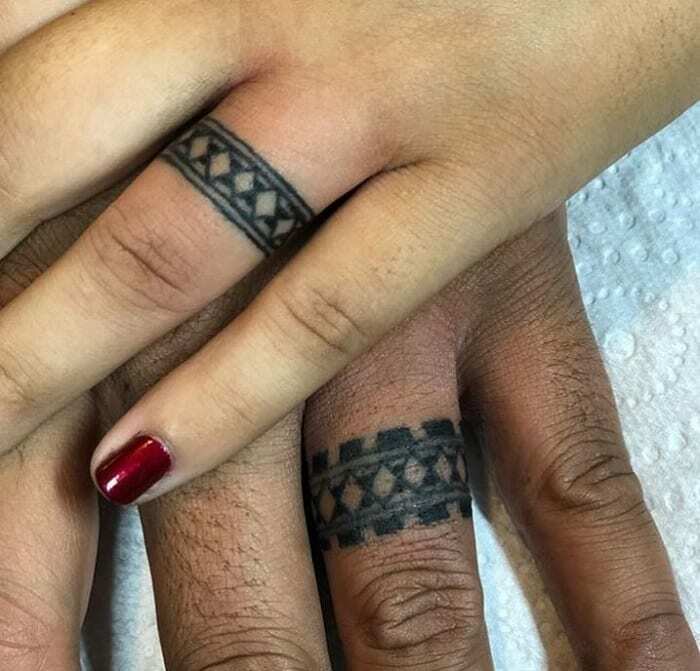 These two went a step further than most people, actually tattooing their wedding rings straight onto their skin. Those tattoos are permanent just like their vows, so there’s no leaving that ring behind. It’s a beautiful idea to remind one another of how seriously they take their commitment. 32. Perfect for the couple who are a perfect pair. 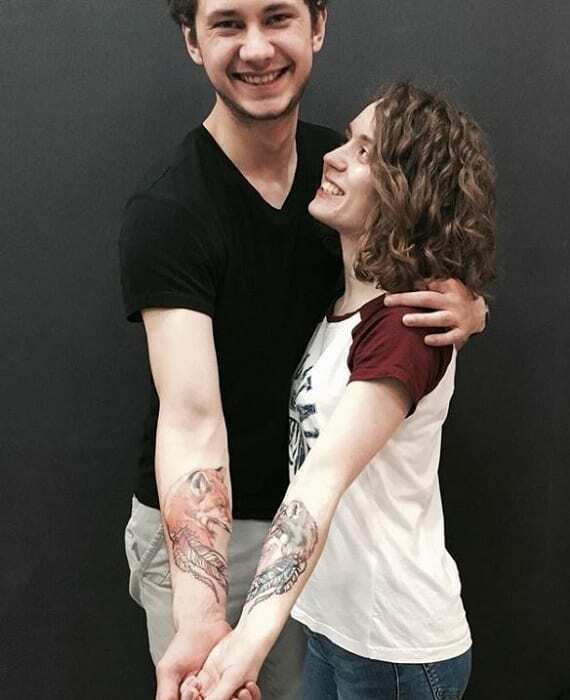 This couple has a pair of tiny tattoos with simple pictures from a deck of cards. 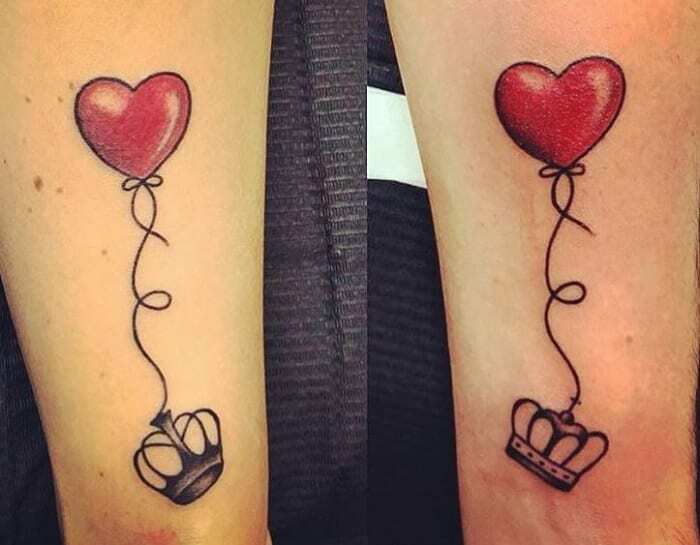 They’re itty-bitty tattoos with a great big message: he’s her king and she’s his queen. Plus, they’re the king and queen of hearts, get it? They have one another’s heart. 33. They’ll never forget what the moon looked like that day. 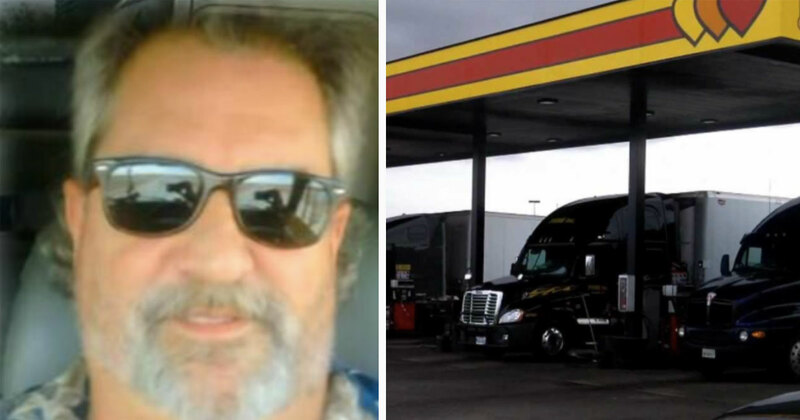 This couple had an ingenious idea. Their matching tattoos have an illustration of redwood trees along with a moon hanging high above them. The kicker that makes these tattoos so meaningful is that the moon is in the right phase of their wedding day. 34. They go together like peanut butter and jelly. 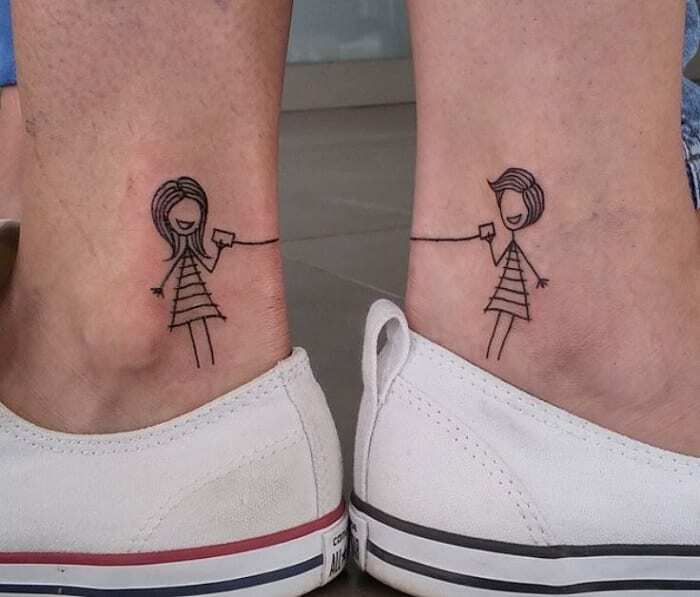 This adorable couples’ tattoo has a sense of humor. Just like the classic sandwich combination, they go together like peanut butter and jelly. It’s especially cute how Jelly is wearing a hair box and Peanut Butter has a dapper bow tie. 35. The pepperoni is even shaped like hearts. 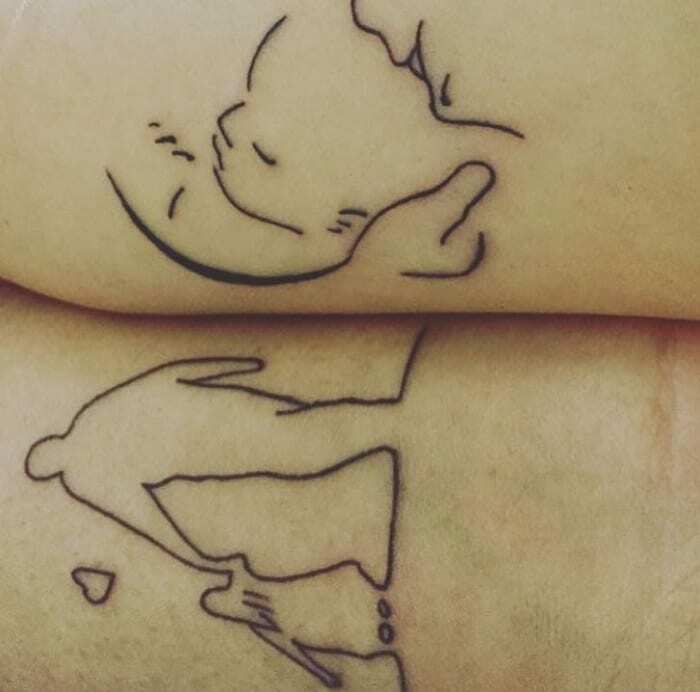 This puny couples’ tattoo is made to give a chuckle, but it’s still meaningful. They’re trying to say that they’re part of the same whole and that they have pieces on one another. There, that wasn’t too cheesy, was it?